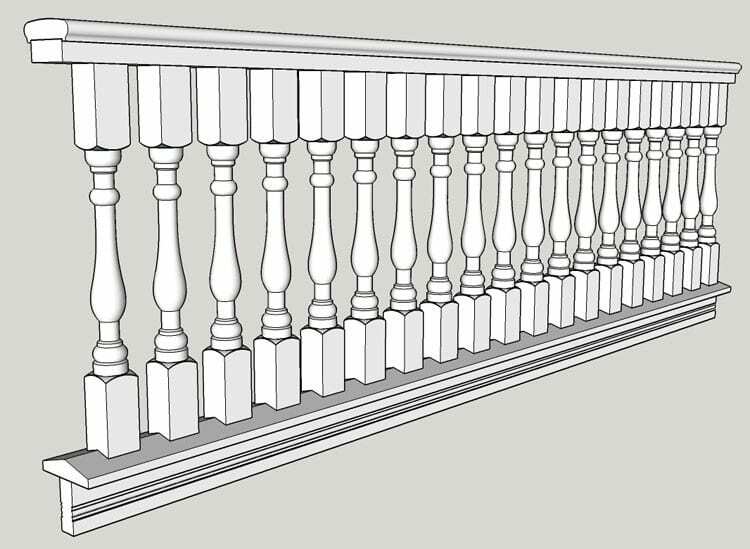 Our mid-size turned baluster, the 2 1/2″ is a balanced size that compliments porches large and small. Use with our 4″ OR 6″ Porch Rail Systems. These 2 1/2″ wide wood porch spindles represent our “midsize” option. A very versatile size, they can used on small or large homes and porches alike with success. This is our 2nd-best selling spindle, behind only the 3 1/2″ Porch Spindles. Actual Width: 2 1/2″. Specify length. Turned portion is 15″ long, centered in the spindle. Bottom notch option reduces length by 1/8″. Example: 10′ of rail, which is 120″. Take 120 divided by 5 = 22.9. So 22 spindles needed. What height of spindle do I need? Our most popular stock design. Revival reflects the influences often found in the architecture of the late Victorian era. Although all of our stock designs are considered Victorian, this classic shape captures the essence of a robust Victorian front porch. Particularly popular in the southeastern U.S., the Tuscan spindle design incorporates a more angular style found in architecture with Italianate influences. Our Colonial spindle design features the simpler, straighter shape of the early Victorian era resulting in a very stately look for your porch.